A few diet tweaks can help you quickly reduce your sugar intake, knock down your disease risk, and protect your ticker. Bonus: you’ll probably drop some pounds in the process. 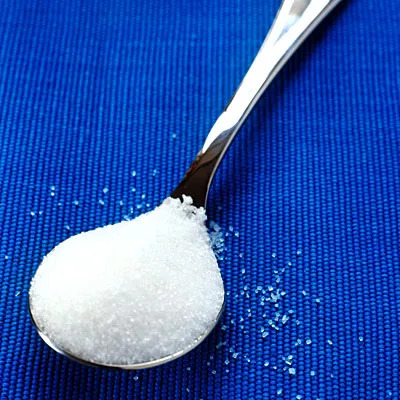 Weâre swimming in sugar: Americans take in more than 22 teaspoons of âadded sugarâ each day. That's the kind put into food, either by manufacturers, such as cookies and candy, or by you, like stirring sugar into your coffee. This sticky habit snowballs into the equivalent of more than 14 four-pound sacks of sugar per person each year. And all that sweet stuff is affecting our health. According to a new Centers for Disease Control and Prevention study published in the journalÂ JAMA Internal Medicine, the added sugar the average American consumes can increase their risk of death from heart disease by almost 20%âregardless of other health problems. And for the 10% of Americans who get a quarter of their calories from added sugar, the risk more than doubles. Nearly 40% of the added sugar in Americansâ diets comes from sugary beverages like soda, sweet tea, lemonade, and fruit punch. Just one 12-ounce can of regular soda contains about 140 calories, all from added sugar. The American Heart Association recommends limiting added sugars to less than 100 calories daily for women and 150 for men, which means that a single soda meets or exceeds the limit. Kick the habit, and replace sweet drinks with good, old-fashioned H2O spruced up with healthy, flavorful add-ins like lemon, lime, fresh mint, cucumber, or a little mashed fruit. Sugar hides in dozens of foods you might not suspect. Unfortunately, thereâs no way to look at a Nutrition Facts label and tell how many calories come from added sugar. And even the grams of sugar can be deceiving, because thereâs no distinction between naturally occurring sugar versus sugar thatâs been added. For example, if you look at the label on a bag of frozen raspberries, the only ingredient is raspberries and yet youâll still see 6 grams of sugar listed, even though none was added to the bag. The best way to scope out added sugar (the type the study focused on) is to read ingredient lists. Look for words including brown sugar, corn syrup, maltose, fructose, dextrose, molasses, agave, brown rice syrup, cane sugar, cane syrup, and evaporated cane juice. By law, ingredients must be included in descending order by weight, so the higher up on the list you see one of these additives, the more sugar per bite. And you may find multiple types. These 12 products donât seem overly sweet, but they typically contain some form of added sugar in the ingredients: ketchup, salad dressing, soup, crackers, flavored yogurt, spaghetti sauce, bread, frozen dinners, granola, protein bars and shakes, and sushi. Itâs becoming easier to find plain versions of many foods these days. Iâm not talking about products made with calorie free-sweeteners (which I donât recommendâcheck out my previous post on 5 Steps to Quitting Artificial Sweeteners), but truly unsweetened goods, including Greek yogurt, oatmeal, and almond milk. Switching from sweetened vanilla almond milk, which contains evaporated cane juice, to unsweetened vanilla, which lists no added sweeteners, saves the equivalent of about three teaspoons of sugar per cup. If you need a little sweetness, add it yourself to control the amount and type you use. For example, some of my clients prefer swirling a teaspoon of organic honey or maple syrup into yogurt or oatmeal at breakfast, both of which provide some nutrients and antioxidants, rather than buying pre-sweetened versions made with more refined sweeteners. One of my favorite tricks to share with my clients is how to replace foods laden with added sugar for fruit which is naturally sweet and just as satisfying. For example, in place of strawberry jam on PB&Js, use warmed up frozen strawberries. Just one level tablespoon of jam packs 50 calories and is typically made with three sweeteners: high fructose corn syrup, corn syrup, and sugar. A half cup of frozen strawberries (about eight times the volume), warmed up on the stovetop and seasoned with a little cinnamon or ginger, contains less than 25 calories with no added sugar, and has bonus vitamins, fiber, and antioxidants. Fruitâwhether it's fresh, baked, grilled, or pureedâmakes a great replacement for sugar in lots of dishes, from cookies to coleslaw. For more on fruit, check out my previous post on Why Fruit Isn't Making You Fat. Itâs not realistic for most people to go through life never having a sweet splurge. But setting some limits on how often you indulge in sugar-rich foods is certainly reasonable. Pick a day or two a week, maybe Wednesdays and Saturdays, to enjoy canât-live-without goodies like candy, baked goods, or ice cream. Just knowing that you have a pre-planned treat to look forward to can help you avoid giving into temptation more often, and can result in seriously slashing your overall sugar intake.